Time management and speed is the essential traits to crack any competitive exam especially for Quantitative Section which is hard nut to crack for most of the aspirants. One has to learn few tricks and basic concepts to speed up calculation during the examination. And, one of the basic trick is Squaring of the two numbers and also know Square root rule. It's not the hard one and might you have listen the tricks of multiplication using Vedic Maths. But, it all depends on your base and how you proceeded in your school days. Now, it might be difficult to follow the new multiplication rule at this stage where your only aim is to crack competitive exam. So, instead of sharing any other Multiplication rule, I would advise learn table from 2-20 the basic one. And, then practice questions of Quantitative Aptitude Test. Step-1: The base number in this 50. So, 502 = 2500. Now, we have to work with initial 2 digits .i.e. "25"
Step-2: Now, do 50-36 = 14. Do square of this "14" i.e. 142 = 196. Step-3: Take "196" square of 14 and compare with the above image. So, "1" of 196 will set aside for carry and "96" will be used in Tens and Units place of the answer. As, in the case of 362 put "96" to its tens and units place. You are half done in finding the square of 36- __96. Now, you have to find first 2 digits. Step-4: For first 2 digits, do 25-14 = 11. In this, "25" comes from Step-1 and "14" from Step-2. Step-6: Put "12" in blank space of thousand and hundred place of 362. You will get 362= 1296. Now, take an example of 412. Follow the same step as mentioned above. Here, you will 50-41 = 9 and its square is "81". It does not generate carry number. So, 25-9= 16. Hence, 16-81 = 1681 = 412. Note: Practice all square from 31-50 to get speed up in this process. - This follows the same steps as mentioned above, but has slight difference in Step-4 mentioned above. In Step-4, you have to subtract the number from "25". As, you are finding the square less then 50. But, here you are finding square greater than 50. So, take example of 662 = 4356. Step-1 to Step-3 are same. Step-4: Add "25" to "16". 16 because 66-50 = 16. Step-5: The carry number generated during squaring of 16 is "2" as the square of 16 is 256. Step-6: Add 25+16= 41 + 2 ()carry number) = 43. Hence, you get the square of 66 i.e. 43-56 = 4356. (taking together). - This method is slightly different and one has to learn it carefully. Let's take an example of 822 = 6724 (this we have to find). Step-1: Subtract 82 from 100 i.e. 100-82 = 18 to find the difference for further calculation. Step-2: Now, Square the number "18" (got from the difference). You will get "324". Step-3: Take tens and units place of number "324" i.e. 24 and keep "3" as a carry number. Step-4: This is the important step. Now, you have subtract 18 from 82 (not from 100). And, then add "3" i.e. a carry number of 182. Step-5: You get the 82-18+3= 67 and "24" from tens and units place of 182. Hence, 822 = 67-24 = 6724. 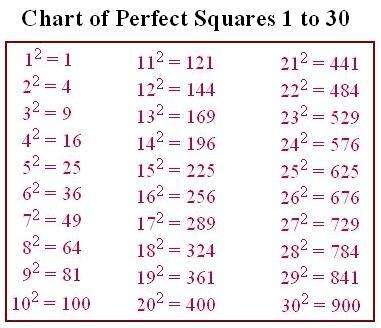 Note: You have to add the (difference of 100 - the number whose square has to be calculated) and (the number whose square has to be calculated). - This trick is also similar to the above one mentioned. And, you can understand that you have to find the square of the number above 100. Hence, you have to add the numbers not subtract. Step-1: Add 100+the number whose square has to calculated. For example, let's get the square of 113. Step-2: Since, 113-100 = 13 so get the square of 13 i.e. 169. Step-3: Take "69" as the tens and units place for square of 113. Step-4: Now, add "13" to 113 i.e. 113+13 = 126 (it will be the other half part of 1132). Step-5: Now, add carry number i.e. 1 of number "169" to 126. Then, you get 126+1 = 127. Step-6: Hence, 1132= 127-69= 12769. This might be good to use trick like Squaring of the number. You find it easy while doing calculation. On the contrary, this might be the same case for Multiplication of 2 different number. Instead, i advise and on my experience you no need to do this. As, we have set our base simple and traditional method of multiplication. Even getting the trick, you won't be able to get at the time of examination. While doing exams, you are under pressure and will do what your brain has remembered in its learning that is your school days. So, practice as much as you can to speed up your calculation and Practice can help you score in Quantitative Aptitude section. Short Trick to Find Cube Root of a Number. Formula and concept of Number System. Comments "Fast Trick to do Square of a number for Competitive Exams"